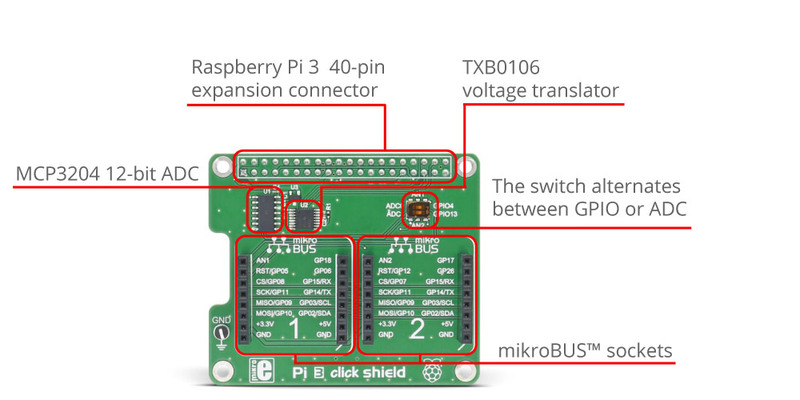 By adding two mikroBUS™ sockets to your Raspberry Pi 3, the Pi 3 click shield allows you to experiment with hundreds of click boards™ from our ever expanding range. WiFi, Lora, Bluetooth, GSM, GPS, RFID, OLED, speech recognition, environmental sensors, movement sensors, biosensors, LEDs, relays, — you name it, we got it! The Pi 3 click shield is compatible with Raspberry Pi 3 model B, 2 B, 1 A+ and B+. The shield has an onboard ADC which enables the measuring of the analogue levels. Since the Raspberry Pi® doesn't have an analogue pin on the expansion connector, by adding an ADC we've enabled the usage of any click board™ from our offer. ADC onboard is MCP3204 12-bit Analog-to-Digital Converter from Microchip. It also has a switch selector which allows the pin on the mikroBUS™ to be directed to GPIO or to the ADC. Because of the reference voltage which is 4.096V, the ADC works on 5V, and since the Raspberry Pi® GPIO voltage level is 3.3V, voltage translator is needed. That's why we've included TXB0106 voltage translator from Texas Instruments. This shield has two mikroBUS™ sockets so that you can add hundreds click boards™ from our ever expanding range. The package includes single 2x20 female sockets and 2x12mmm distancer with 2 screws. Software examples for click boards™ are available on Libstock, giving you a repository of working code - a great starting point for your own projects. Pi 3 Model B has the same layout as the Pi 1 Model A+, Pi 1 B+ and Pi 2 Model B. 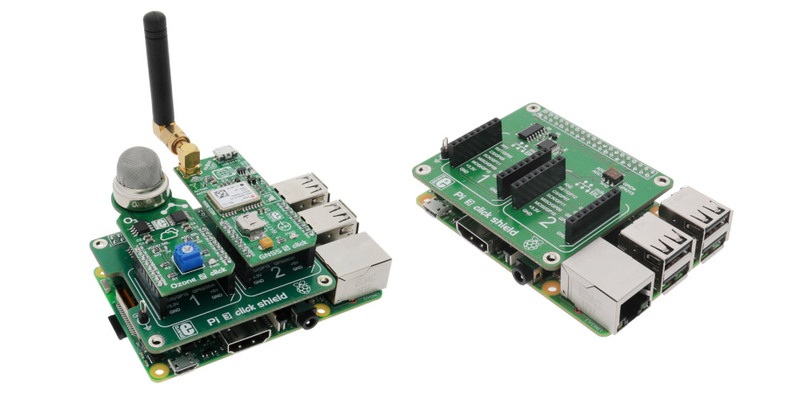 The picture on the right shows Pi 3 click shield connected to the Raspberry Pi® 3 model B, the picture on the left shows the connected shield along with two click boards™: Ozone 2 and GNSS 5 click. Along with Pi 3 click shield, we are providing examples of usage for SPI, I2C and UART peripherals for our click boards™. They are written in Python programing language. There is also an example of usage for the ADC integrated on the Pi 3 shield. More details about examples and examples code can be found on our Libstock and GitHub pages.